Basalt Stone is an attractive and durable stone option for paving and dimensional use. Basalt is a medium to dark gray, fine grained igneous rock – similar to granite in durability. As a fine-grained extrusive equivalent of gabbro, igneous stones (granite, syenite, diorite, gabbro, andesite and basalt) are formed when magma, or molten rock / lava, within the earth cools. The earth’s largest supply of Basalt stretches through the Columbia River area in the states of Washington, Oregon, and Idaho to distant areas of China, India, Namibia, South Africa, and the Siberian area of Russia. Basalt is freeze resistant and used for a wide variety of purposes including crushed aggregate road base, concrete aggregate, asphalt pavement aggregate, railroad ballast, filter stone in drain fields, and may other purposes. However, the most attractive applications of this gorgeous dark gray stone can be found in paving stone and dimensional stone. Basalt can be specified for use as paving, building veneer, monuments, and other stone products. For paving and floor tile applications, almost any interior or exterior sizes up to 36” x 36” at 3/4” thick up to 6″ thickness are available. Finishes range from: flamed (most popular) brushed, honed, polished, bush hammer, chiseled, sand blasted, all adding to the character and foot friendly surface necessary to create a beautiful look. A contemporary look was achieved for our client’s driveway in the image above, using cobblestone pavers; 4″ x 4″ x 1-1/2″ high, sawn 6 sides with flamed top finish. 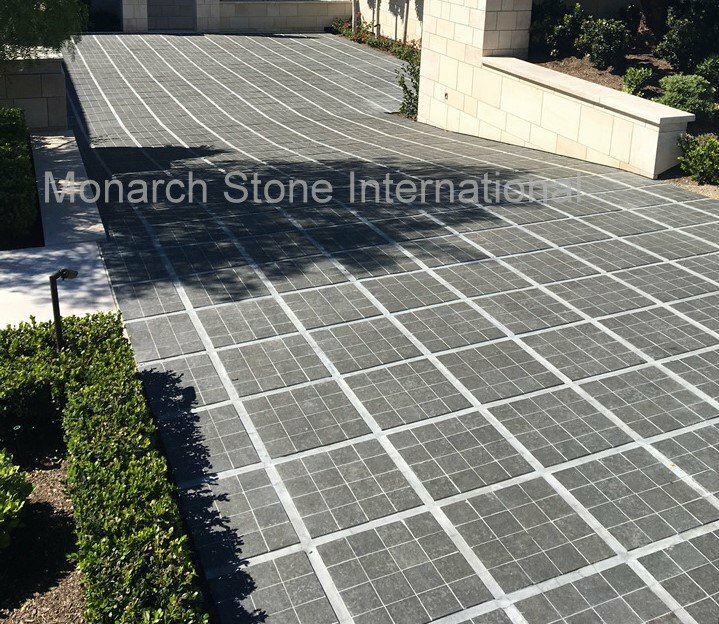 Monarch Stone International understands basalt and its many attributes. Our expert knowledge and competitive prices on a vast selection of natural paving stone options make us the best choice for your next project! Call today to discuss your requirements!